Bullstrap Apple Watch Straps have been on my wish list for quite a while since I found them on Instagram a few months ago. I have really fallen in love with the design and textures that the straps are born with, and as I see them around randomly on some pedestrians’ wrist, I am more eager to get my hands on trying out any of their straps. The fundamental reason that I have not got one until the review units generously shipped to me is that there is no straps for the 38mm Apple Watch which is kind of bummer. As of this review being published, if you are a 38mm Apple Watch user, you can yet get yours ordered but it is coming this week. It is hard to believe that there has been no review on Bullstrap’s products but most went to Nomad Italian Straps with basically the same design but with $50 markup on Bullstrap’s listed price. Anyhow, in this review, we will take a look at the 38mm Classic and Terra Straps from Bullstrap. They are identical to the 42mm straps in terms of material and design so this review, or say preview with the 38mm variants would basically apply across the board. Based on Florida, U.S., Bullstrap offers exceptional craftsmanship on their leather straps with finest Italian Calfskin Leather. 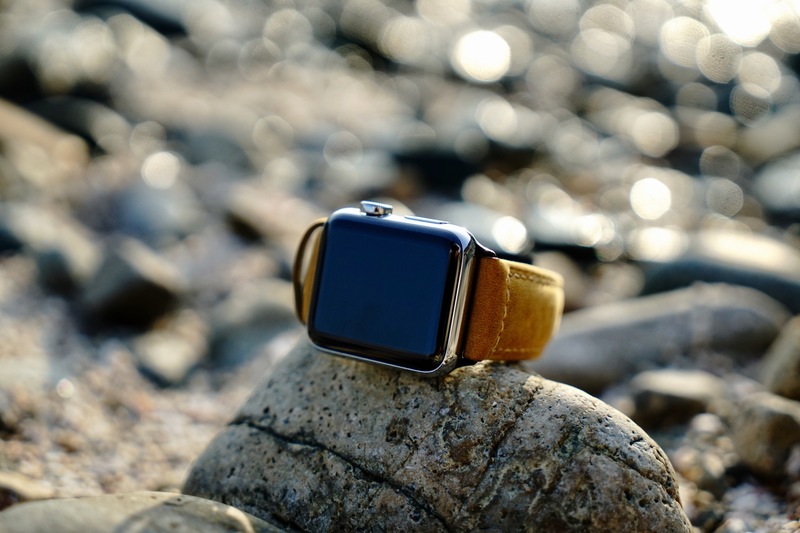 Along with reinforced, durable linen thread and a two-tone soft leather backing, Bullstrap Apple Watch Straps are handcrafted with excellent quality and the elegant appearance ages with user’s own style over time. The Bullstrap Apple Watch straps are shipped with very nice packaging with a fluff inner-layer surface, like what you should expect for a luxury watch case, and the band is secured by sleek rubber band with a fine printed message card to customers. The Classic and Terra straps are all made of Italian calfskin leather which means the leather will grow and darken overtime as the leather ages me with wear as leather ages. Both adapters and buckles are made of 316L Steel with a brushed finish which actually fits better with the aluminum Apple Watches. Another shining point of the strap is the Linen Stitching. This makes the watch strap looks classy and matches better with the classic buckle design. I really appreciate the perfection that the stitching work has been done with such a thick piece of leather. The stitching also looks gorgeous on the soft leather backing, around the adjustment holes and Bullstrap brand engraving. Despite the fact Vintage Strap looks more aesthetically appealing to me, I do love the styles of both review units. The unprocessed, raw, unsealed, unpainted leather that gives the strap a rugged feel and classic design. Due to the thickness of the leather itself, the strap does feel stiff out of the box. But after wearing for a few days, it is getting better and also starting to grow into an even more vintage look. For the inner layer of thin and soft leather, it is frictionless to the skin and it is very comfortable on the wrist. A little complaint is that the buckle is quite tight when you put it on and hook the tongue into the adjustment hole. It does take some time to get used to exerting force with the thumb to push the buckle in order to release the band from the buckle tongue. So what do you think about the Classic and Terra Straps from Bullstrap? Let me know in the comments and be sure to check out more Apple Watch related reviews on the blog and more straps on Bullstrap and stay tuned with the 38mm options coming up this week. Apple Watch bands have been quite popular among the customers also Really nice quality, it’s my experience after buying it.Moreover, all color combinations are very elegant so thanks for sharing this watch with us. http://www.google.com-the best facilator i ever met.